This is the Cameron of Erracht variant, the military tartan designed for and worn by the Cameron Highlanders and, later, the Queen's Own Cameron Highlanders. Cameron Clan Tartan Ribbon is also available in 10mm (3/8"), 16mm (5/8"), 25mm (1"), 38mm (1½") and 75mm (3") widths. PLEASE NOTE Cameron of Erracht is produced by a different weaver and so is supplied on 20m (not 25m) reels. Cameron of Lochiel (Hunting) Tartan Ribbon is also available in 12mm (1/2") and 38mm (1½") widths on larger 50m (55yd) bulk reels. 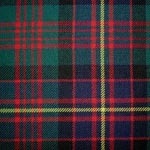 Please note that tartan ribbon supplied 50m bulk reels is from a different manufacturer and stocks are limited. 50m bulk reels offer unbeatable value for money.